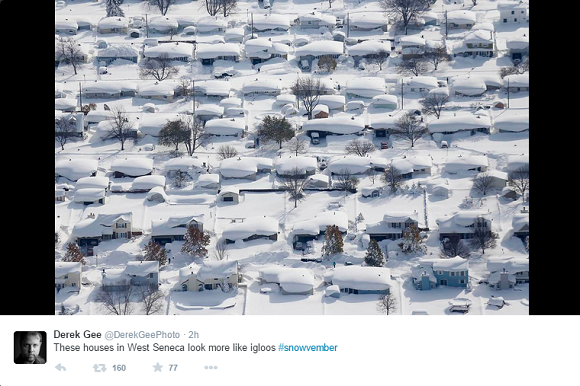 Over five feet (1.5 meters) of snow fell just south of Buffalo, New York on November 18, 2014. A second round is forecast for today. Lake-effect snow is nothing new for those north and east of Lakes Erie and Ontario. When it happens, snow totals climb over three to four feet (over a meter) in less than 24 hours. In isolated spots around the Buffalo, New York area this week, over five feet (1.5 meters!) of snow fell earlier this week (November 18-19, 2014), and a second round is happening and expected to continue through Friday. 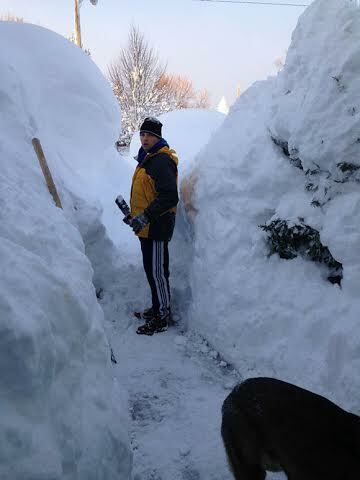 Digging out of the snow in West Seneca, NY on November 19, 2014. 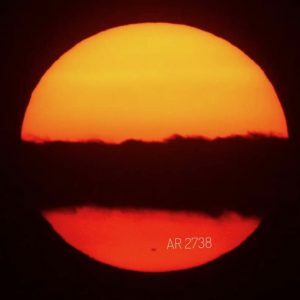 Image appears courtesy of Carrie Boye Roof. Old man winter has arrived early for parts of North America. Arctic air has invaded the eastern two thirds of the United States and Canada. Over half of the United States had snowfall on the ground on Tuesday, November 18. All 50 states had a temperature reading of 32 degrees Fahrenheit (0 degrees Celsius) or lower that day. An area of low pressure pushed off to the northeast of Lake Erie and Lake Ontario. Cold, Arctic air blew across the lakes. The temperature contrast of the cold air going over the warmer waters of Lake Erie and Ontario is what contributed to the fetch of training snow bands. The terrain helps to force air to rise and create clouds and moisture. It resulted in a narrow band of extremely heavy snow that fell at rates of three to five inches (8-13 cm) an hour. Visibility was down to zero, and totals were adding up in feet. Many spots have already recorded over five feet of snow. Unfortunately, this is from the first of two waves that will impact the area. The second wave is occurring now, and an additional two feet of snow is possible in isolated spots before it is all said and done. The first round of snow is responsible for killing seven people. 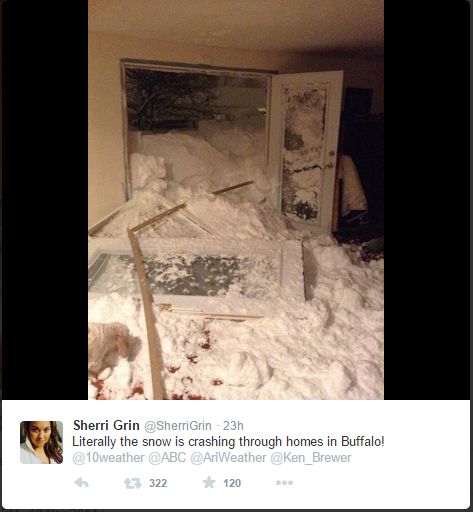 According to CNN, seven deaths are to be blamed for the incredible snowstorm across Buffalo, New York. At least three of those deaths were due to heart attacks from shoveling out the snow. Meanwhile, other deaths occurred from being stranded in their vehicles or from traffic accidents. The snow has left people stranded on roads and in their homes. Houses are nearly covered from ground to roof with snow. You can go within 10 miles of one spot and see drastic changes in snow coverage. For instance, 65 inches (165 cm) of snow fell four miles south of Cheektowaga. 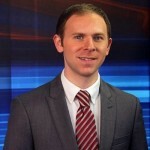 However, only 2 inches (5 cm) of snow was recorded three miles north of Cheektowaga. In other words, a difference of 62 inches (157.5 cm) of snow fell within seven miles. 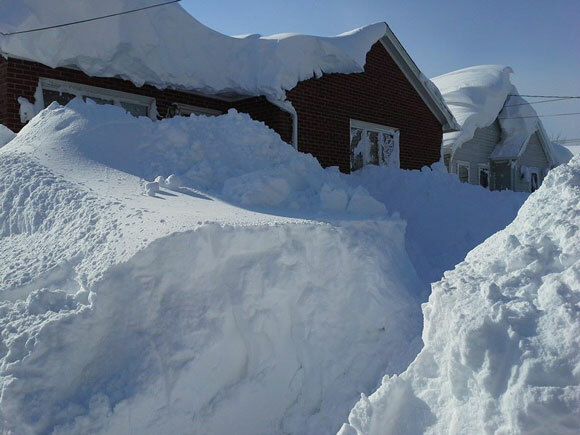 Buffalo broke a record daily maximum snowfall of 7.6 inches (19.3 cm) on November 19, 2014. Most of the heaviest amounts were to the south of the city. Volunteers are on snowmobiles working with the fire department to rescue anyone who is stranded or hurt. They are also bringing in supplies and food. The snow stranded motorists and for some, trapped them in their vehicles. 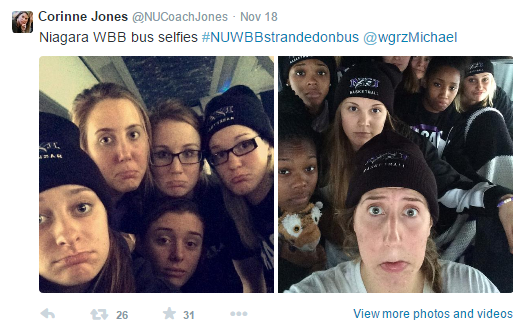 The Niagara University women’s basketball team was stuck on a bus as the heavy snow trapped them for over 24 hours. Members of the team tweeted out pictures during the storm and were finally rescued and given food and water. 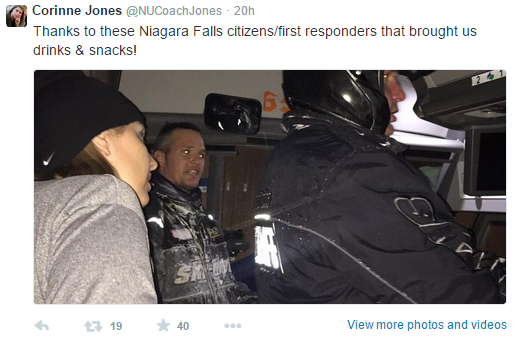 Briana Lucas urging people to help the Niagara Basketball team via Twitter. 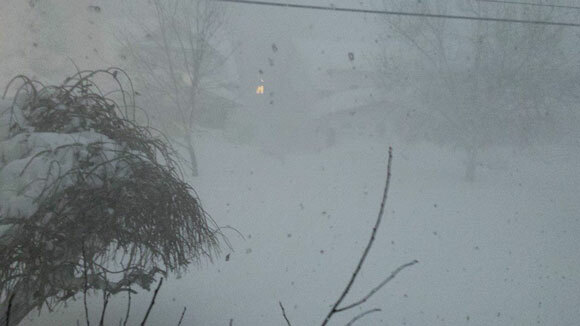 White out conditions in south Buffalo, NY on November 18, 2014. Image appears courtesy of Kelly LaBella. A house buried in the snow in Buffalo, NY on November 19, 2014. Image appears courtesy of Scott Stranahan. 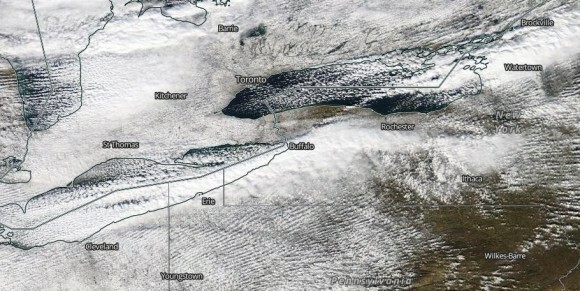 Bottom line: An unusual and almost unprecedented lake-effect snow formed on November 17-18, 2014 and produced over five feet of snow in areas just south of Buffalo, New York. At least seven people died from the storm, and several people were trapped in their homes and vehicles due to the heavy snow. A second round of lake-effect snow could provide an additional one to two feet in spots south of Buffalo, New York on November 20, 2014. Is this the sign of what’s to come for the United States this winter? It is too soon to tell. However, it doesn’t look good if this pattern continues over the next several months.